As a fan of rhythm games, I knew I had to be the one to review Old School Musical. It looked like it was chock full of chiptune goodness, but that was all I knew about it initially. Then once I started playing it, I quickly saw this was a game that embraced and celebrated video game history. It tells the story of two brothers, Tib and Rob, who live with their antagonistic mother on an island. As they grow up, their mother pushes them to train so that they can one day become true heroes. 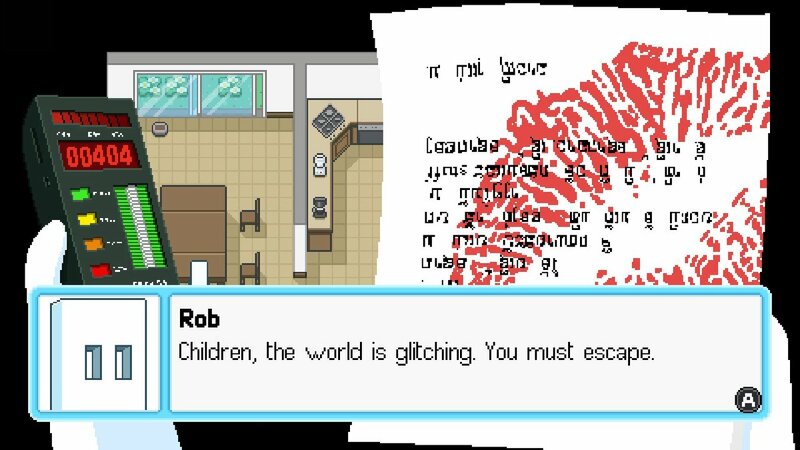 One day years later, their island starts glitching out, and Tib and Rob find a note left by their missing mother, telling them only they can stop the glitches. Thus they set off on a hilarious and fourth wall breaking adventure. The concept of a world glitching is a smart decision that allows Tib and Rob to warp into unusual situations. They wander into other worlds full of very familiar faces, such as a Mega Man-inspired world, one that looks awfully like Hyrule, deep space and much more. As they explore, they exchange banter back and forth, often full of humor and inside jokes. Their interaction also does a good job of showing the different personalities of both brothers. Tib is the oldest, and also the shortest, of the two, and likes to act mature and collected. Rob, the youngest and tallest, is quick to emotion and often does things without thinking first. Their mother, or Big Mama as they call her, is portrayed as a cruel and often sadistic character, spurring the boys to action with harsh training regimens and verbal abuse. Nevertheless, she’s the only parent they’ve ever known, so they are earnest in their desire to find her and save the day. 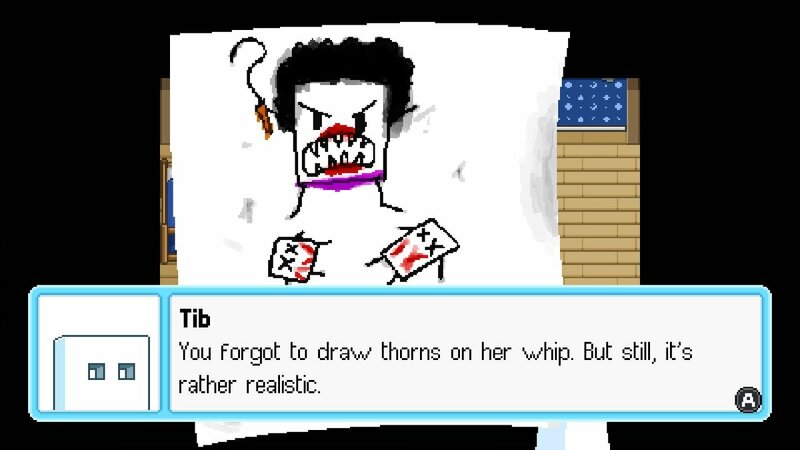 Tib and Rob’s mom definitely has echoes of The Binding of Isaac. It might seem strange to spend so long talking about the story in a rhythm game, but the Story mode is surprisingly robust in Old School Musical. I grew to love Tib and Rob in their meandering adventures through dimensions, and while there is no in-game clock, I estimate I spent somewhere between three and five hours playing through the story. As for how gameplay is handled, it should be familiar to any who have ever played a rhythm game, with some unique twists. Like most rhythm games, Old School Musical has notes flying at you which you need to press in time. 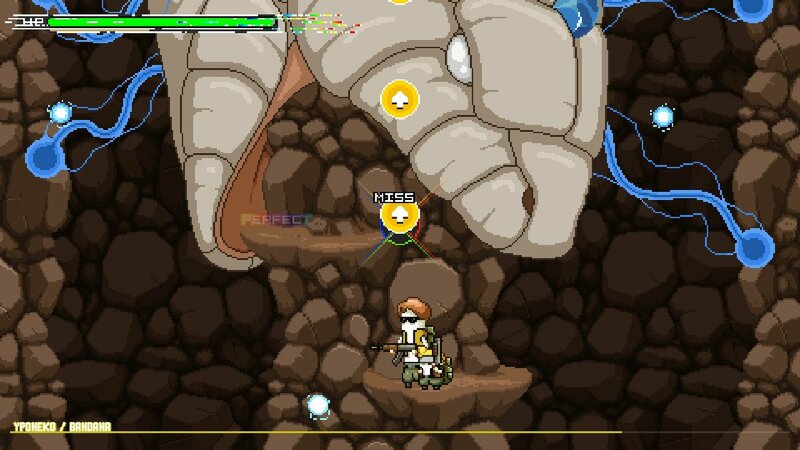 You can use either the directional buttons or the YXAB buttons to hit them, as well as the shoulder buttons. By consistently hitting them with precise timing, you’ll fill up your Fury meter. Once that’s full, you’ll get rainbow-colored Cools and Perfects when you hit notes, as well as regain lost HP for each successful button press. To keep things interesting, as you wait for notes to hit the center of the screen, there’s a lot happening in the background. And I mean a LOT. As you’re pressing buttons, Tib and Rob scamper about the screen, fighting foes, racing cars, infiltrating facilities, swinging swords and the like. It’s very easy to get distracted, and that’s part of the game’s charm. Thankfully, they don’t introduce any gameplay twists in Story mode. Additionally, each song will be interspersed with dialogue between Tib and Rob, which gives you a much deserved break. Just don’t expect any breaks in the other modes of the game, as they are pure note bashing. As Story mode progresses, there are lots of cutscenes full of delightful insanity. I especially appreciated nods to series like Pokémon, with you choosing commands for Tib and Rob as they’re attacked by hateful creatures. Later in the game, you’ll encounter some areas where Tib and Rob can explore and talk with townspeople. This led to further hilarity, as well as providing some actual backstory for the brothers. Suffice to say, they’re not exactly human, but that’s all I can say about it. I invite you to play through the story yourselves and appreciate the emotional crests and humor of the plot. While the Story mode is certainly a highlight of Old School Musical, and it’s sad when it’s over, there’s still more that the game offers. 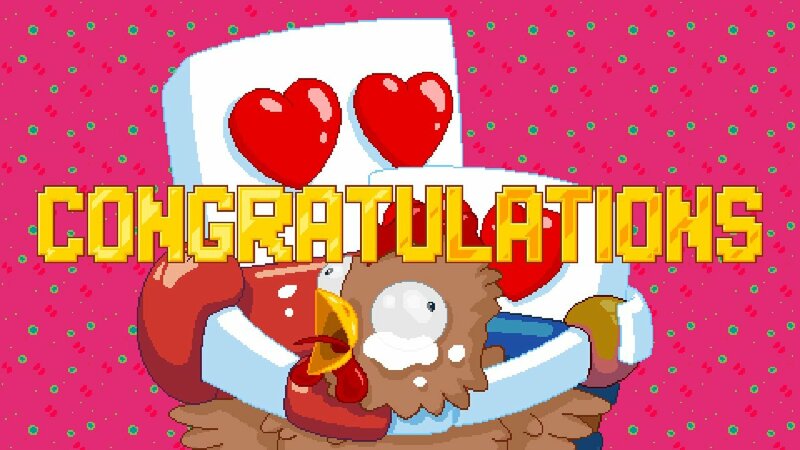 Once you beat the story you unlock another mode called Chicken Republic. Put simply, the chickens that have suffered abuse in videogames have had it, and form a republic for all like-minded fowl. While you briefly encounter these ornery cluckers in the story, in Chicken Republic they throw some neat twists at you. At the start of each of the 50 stages, you’ll have a chicken wizard enchant you. As you play through the stages, tons of visual status effects hinder you, such as snowflakes falling onto your screen, changing the color to old Game Boy palettes, warping everything on the screen and much more. Honestly I kept expecting them to run out of ideas, but this postgame segment was just as robust if not more so than the Story mode. Perhaps the most hilarious status effect is one stage where a pixelated shirtless man climbs up the screen and then spends the rest of the level dancing in front of your notes. I won’t ruin it by telling you which stage, but I will say it’s delightfully twisted and worth playing yourself. Besides Story mode and Chicken Republic, there is also the Arcade mode. This lets you select any song you’ve played and try and get a better score. The best you can do is an S, which means you hit 100% of the notes in a stage perfectly, without any misses. While I love the game, I was not able to get any S grades, usually getting A’s instead. Though I played through Story on Normal difficulty, you can always change it to Easy if you need a break, or if you want a challenge, choose Hard. Just don’t expect to get through that difficulty unscathed, as even the first song in the game is a true challenge, let alone the more fast-paced songs. I felt Normal was a very fair difficulty for the game, as it made me work for my victories but wasn’t overly cruel. Besides this there is also a Multiplayer mode, but I was unable to try it for my review. I’ve spent a while talking about all the gameplay, but it wouldn’t be right not to cover the aesthetic design in Old School Musical. Though it’s not overly complex, there’s a lot of color and cartoonish humor in every pixel. I loved the cutscenes as well, as our heroic brothers are visually transformed to fit into the various worlds they encounter. I also enjoyed watching them scamper about the screen, and only found a few stages visually hard to look at. This was due to a blurriness caused by a cobbled path constantly scrolling, but it was a minor setback. On the music side of things, Old School Musical is a delight. La Moutarde enlisted the aid of several talented musicians to aid them with crafting the sound of the game, including the following: Dubmood, Hello World, Le Plancton, Yponeko and Zabutom. There is a wonderful range of songs, from high-flying space operas to fantasy-laden adventures to completely crazy stuff. 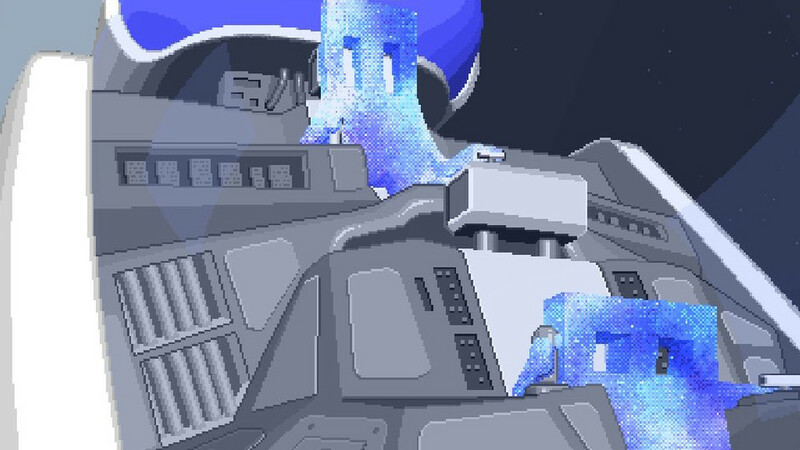 Some of my favorite songs were the ones that referenced other games, such as the R-Type-inspired stage playing music that sounds like remixed Tetris. I normally don’t focus much on the music in games, but in this one, the following were songs I especially liked: Ballad of the Cool Fish, Bloody Beaks, Confucius Slam, Datasalen, Ghost… GHOST!! !, Hundred Dollar Volvo Road Trip, Keygen 23, Korobeiniki, Making Music on the Internet, Matriarchy and Megalonaan. With over 50+ songs, there’s a lot to love here. Aesthetically speaking, Old School Musical will make fans of retro games very happy. In closing, I had a fantastic time with Old School Musical. It’s quirky, different, full of humor and charm. For $12.99 you’re getting a hell of a bargain, providing at least 10 hours of gameplay, and that’s without trying to get high scores on all the songs in Arcade mode. La Moutarde wasn’t on my radar before, but they certainly are now. If you own a Switch or game on Steam, Old School Musical is rhythm game you should not miss. Go help Tib and Rob save the day; you won’t regret it.